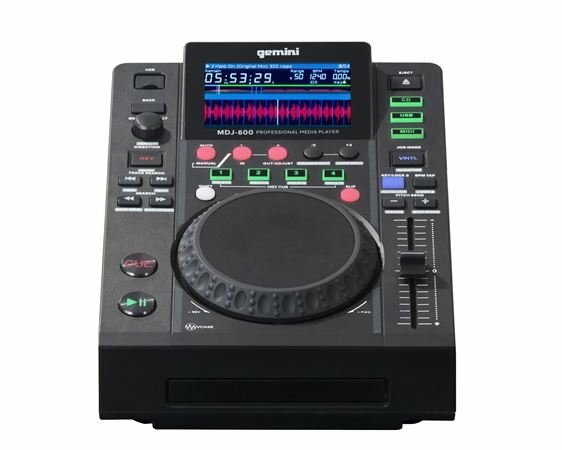 Shop Gemini MDJ600 CD USB Media Player and MIDI controller from AMS with 0% Interest Payment Plans and Free Shipping. The MDJ-600’s intuitive interface will have you spending less time learning and free up precious time for you to experiment with the 4 Hot Cues, 8 Auto Loops, and the 5” touch-sensitive jog wheel with LCD display and resistance control to Slip and Scratch. Bonus MIDI capabilities mean you can even control the parameters of your favorite DJ software directly from the unit, routing your audio through its 24-bit/192kHz soundcard. Of course, the MDJ-600 is fully compatible with our V-Case Library Management Software, which offers users a faster, easier way to manage their music libraries.